I said I won't be posting "fixes", but this one is way too annoying not to help you fix it. If you're using Pidgin with MSN, you probably got lots of "omega.contacts.msn.com" certificate errors today. Here is how to fix it. 1. 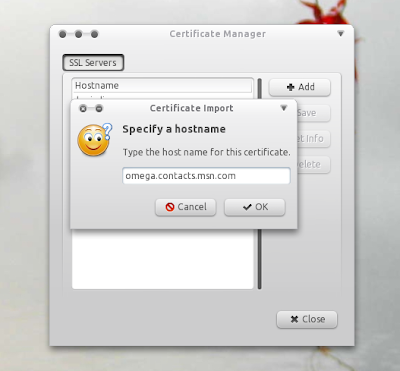 Download this omega.contacts.msn.com certificate. Now click OK and that's it! Thanks to Lazonakf for the fix!